There are several ways to give to our hospitals by donating to the NNUH NHS Foundation Trust Charitable Fund (1048170). If you would like your donation to benefit a particular area of the hospital, please let us know so that we can ensure that the money goes to the correct area. You can now donate by text message via JustTextGiving by Vodafone, but please make sure you have the bill payers permission. Text NNUH00 £10 to 70070 to donate to NNUH hospital charity and make a difference today. Remember to include your name and address and where you want your donation to benefit. Please remember that gift aid increases your donation(s) at no extra cost to you. If you are a UK tax-payer, please remember to tick the relevant box or download our form which you can use to send in with a cheque donation. You can download a sponsorship form and/or gift aid declaration form. We have our Amazon Wish List but now you can support the N&N Hospitals Charity when you purchase items through Amazon using their Amazon Smile. 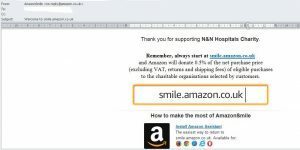 To ensure the hospital charity benefits remember, to always start at smile.amazon.co.uk and Amazon will donate 0.5% of the net purchase price (excluding VAT, returns and shipping fees) of eligible purchases to the charitable organisations selected by customers.